Our Church is over 135 years old you can imagine that “old girl” requires constant up-keep. Over the last couple of years we have been aware that there are some major building works that are required. One of our main projects will be the repair of our large window on the sea side of the Church. Therefore, we have embarked on a massive fund raising exercise so that we can keep the Church in a good state of repair to last the next 135 years. Please try and support as many of these events as you can. As well as raising funds for the restoration you’ll bound to end up having fun too. Donations can given to Linda Mitchell, the Ardrossan treasurer. Click here to view pictures of the restoration work. The majority of the restoration work is to the stonework. Due to the church’s location near to the sea, the sandstone is badly eroded and the mortar pointing is missing. Previous attempts at repairs, where a concrete based coating has been applied, are doing more damage than good as the weather gets in behind the harder surface. Around the large Transept windows the stone tracery is in a perilous condition. The windows are badly bowed and in need of repair. All the windows also require suitable protection against damage from outwith the building. In particular, the close proximity to Ardrossan South Beach leads to erosion from blown sand. 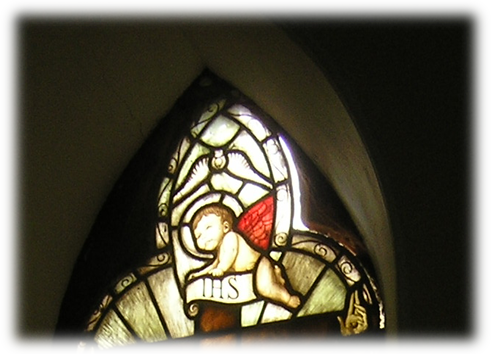 Other cracked and broken glass panes need to be replaced with glass to match by a stained glass conservator. There are areas of plaster damaged by water ingress which require to be repaired and redecorated. We would also like to refurbish the pews and dado panels. As with the main church building there are areas of eroded stonework requiring repointing. The leaded windows to the hall require conservation repairs & protection. Some areas have been affected by damp and require redecoration. Improvements are planned to upgrade the hall complex to modern standards. Accessibility to all areas will be improved, in particular to the toilets. The kitchen requires improvement to align with modern hygiene regulations. Historic Scotland and the Heritage Lottery Fund have provisionally granted us 70% of the estimated cost of the work, the funds are earmarked but we still have to succeed in our second round application. We are still busy applying to other grant-giving bodies and fundraising ourselves. To date the congregation has raised about £12,000 with a further £8,000 in generous donations. We have been working on fundraising for the Restoration for at least a year and a half now. Thank you all for keeping the faith and organising and taking part in fund raising events. So far nothing seems to have happened, but all that is about to change. Your representatives met with the Architect and the contractors (with Martin in attendance) on Wednesday 16th April to discuss the restoration work. The upshot is that the church is to be handed over to the contractors on Monday 28th April, for 16 weeks – that is until mid-August, to enable the work to take place. During that period, all services, on Sundays and Wednesdays, will be held in the church hall. There will be scaffolding inside and outside the church, and that will have implications for the two car boot sales and the garden party, and of course our using the hall for services will impact upon the Junior Church as well. I hope that with goodwill on all sides we will be able to arrive at suitable solutions to any problems that arise. This means that after today we will have one more Sunday service in the church. If you have any questions about the restoration project please see me or Katherine, or any other member of the Vestry. Have you heard about easyfundraising yet? It’s the easiest way to help raise money for St Andrew’s Restoration Fund! If you already shop online with retailers such as Amazon, M&S, Argos, John Lewis, Comet, Vodafone, eBay, Boden and Play.com, then we need you to sign up for free to raise money while you shop! You shop directly with the retailer as you would normally, but if you sign up to http://www.easyfundraising.org.uk/causes/standrewsrestorationfund for free and use the links on the easyfundraising site to take you to the retailer, then a percentage of whatever you spend comes directly to us at no extra cost to yourself. easyfundraising so far by looking at the image on the right. However, we need your help to keep donations coming in. Sign up at http://www.easyfundraising.org.uk/causes/standrewsrestorationfund andstart making a difference…simply by shopping.